Katsu-Don Recipe | World's Best Street Food? 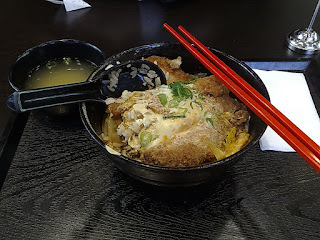 So I recently found out a local restaurant serves katsu-don in my area. I'm delighted, though oddly enough it's served at a European style cafe, which led me wondering what happens if I were to add Gruyere cheese to my Japanese food. I've yet to actually do it, but if there was a recipe I'd use it on it would be katsu-don. This also spurred me to dig out the cookbook, and find my old recipe. I felt it was worth a share, because it's probably one of my favorite street vendor foods. It's a broth, egg, and onion rice bowl with deep-fried pork cutlets, and it's out of this world. It's become a good-luck-charm for students in Japan to consume the night before exams, and considering I need every bit of luck I can get these days, I might start making katsu-don in bulk. Katsudon can also be made with battered chicken or beef.